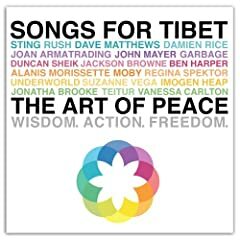 Songs for Tibet - The Art of Peace is a two-CD compilation album featuring a variety of mainstream and indie artists, and includes tracks by Regina Spektor, Imogen Heap, Moby, Damien Rice, Garbage, and others. Proceeds from the album will go toward supporting peace initiatives and Tibetan cultural preservation projects important to the Dalai Lama. Other albums I have heard and can recommend this week include the Portland Cello Project's self-titled album, the Jesu/Battle of Mice EP, Rilo Kiley bass player Pierre de Reeder's solo album The Way That It Was, Ben Weaver's The Axe in the Oak, and the Widow Babies' The Mike Watt EP (a song cycle that pits Mike Watt against a vampire that looks like Abe Lincoln). Road Runner: The Chess Masters 1959-1960 collects Bo Diddley's complete 1959 Chess studio recordings (and half of his 1960 recordings) on two discs and contains many previously unreleased songs as well as alternate versions. Alkaline Trio is reissuing 1500 vinyl copies of its 1983 album, Good Mourning tomorrow. Have I left anything notable off the list? What can you recommend?